I just wanted to briefly post about this week's heart display that we have at our house- which ties in with the 100 Acts of Kindness challenge. I absolutely loved this Hanging Heart Charms tutorial over at MADE, so I decided to adapt a bit it this week to use to help us keep track of our acts of kindness. We attempt to do 25 acts of kindness each week (at a minimum)... so that at the end of the four weeks we've accomplished 100. For Kindness Challenge #3 this week we are supposed to "heart-attack" a friend... so we started cutting out hearts this morning and creating beautiful paint paper. We used paint rollers and forks to make patterns and designs on plain cardstock. 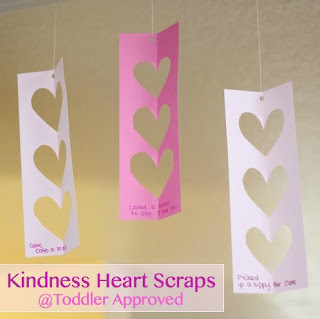 The paint papers (along with plain colored cardstock) will be used to create hearts for the Toddler Approved party garland and the heart scraps will be used to decorate our house with kindness. Each time we did a kind act today, we wrote the simple act on a piece of heart scraps and hung it up in our kitchen doorway. As we do more acts of kindness, the heart scraps will be hung from the tops of the kitchen windows as well. I love how they are a visual reminder of all of the kind things we've been doing. This will also make for a great Valentine's Day decoration during the month of February. Do you have any fun or visual ways that you are using to keep track of acts of kindness around your home or classroom? Stayed tuned for our guest post tomorrow by Jamie at Hands On: As We Grow. Wonderful idea. Right now we are trying to encourage the kindness by having a jelly bean and putting one in a jar to share with a friend. Thanks for linking up to Monday Madness.